Conflict Of Interest Disclaimer: Giant Sports, a sports nutrition brand that I do a substantial amount of formulation, materials management and regulatory work for, markets and sells a premium casein protein product. Oh no! Yet another whey protein versus casein article? When I was doing some background research for this piece, I could not help notice the hundreds upon hundreds of articles written on this topic over the last five years. I was planning on writing a soup-to-nuts article on the topic of casein protein powder, but since the obvious differences between these two types of dairy protein are already written up everywhere else, I have decided to take a much different and perhaps admittedly nuanced approach to this. I want to highlight some of the not-so-obvious, yet-still-important differences between whey protein and casein. I think that all too often, when someone pens an article about this topic it's merely regurgitation of the ?same old same old? and the readership rolls their eyes and stops reading a paragraph into it. So I want to provide you good with reasons to spend the time in reading this further. My goal is for you to come away from this able to critically think what type of protein is the best choice for you the next time you order a can from Tiger Fitness. 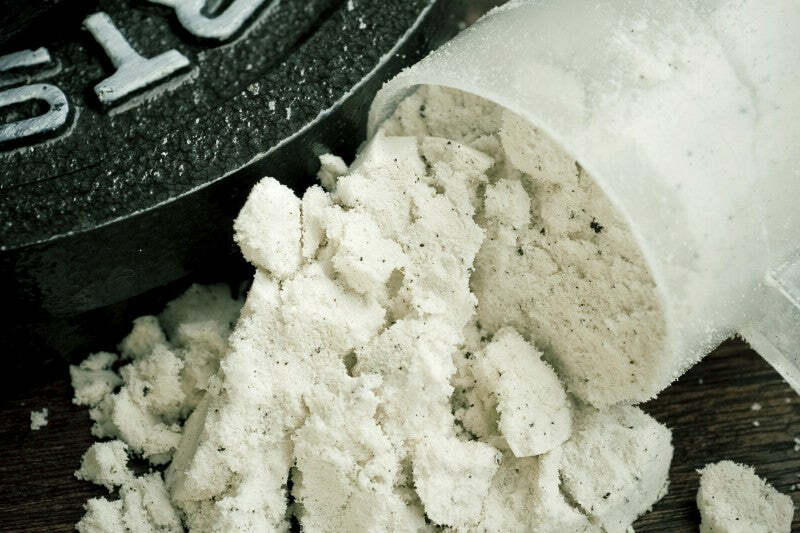 Marc Lobliner discusses the differences between casein and whey protein powder. Casein Protein Powder Better Than Whey? I am a huge fan of caseins, which are about the slowest digesting commercial food proteins that are dairy-based. In fact, for the vast majority of consumers looking to buy a protein supplement, the caseins are probably a better choice then whey protein concentrate, whey protein hydrolysate or even whey protein isolate (more on this in a moment) when it comes to long term health benefits in addition to added muscle mass and performance gains. Do you use a dairy protein virtually every day after your finished training as your post-workout meal? Unless you are an Olympic caliber athlete or a professional athlete where mere fractions of a percent increases in performance really matter (performance ? NOT appearance!) then based on the current published data, you?re likely better off using a casein-based protein product instead of any straight whey concentrate, hydrolysate or isolate. There is a lot of good published, peer reviewed work that reads on the merits of various types of whey protein, substantially fewer pieces that read on the merits of caseins and essentially a veritable dearth of published work comparing and contrasting the two. We?ll go over some of the salient pieces of published research here later on in the article but I want to start off with a review of what has to be considered the seminal peer-reviewed, published article that compares whey protein to casein. This piece is written by Soren Reitelseder, et al, to which a link to the full PDF can be found here. A nice, follow up commentary to this piece of work is written by Stuart Phillips out of McMaster University and is located here. I like the Reitelseder study because it takes a no-BS approach. It looks at skeletal muscle turnover, muscle protein synthesis, net muscle mass gained as well as plasma insulin response curve (which we will discuss further on in a few minutes) among other the more geeky and techy stuff. While studies that solely look at surrogate markers such as mTOR, pAKt?s or IL-6 levels are fascinating to the science geeks among us, they don't offer any real pragmatic pull away to most people training and seeking to improve their training and performance. Looking at the Reitelseder study, we are drawn to some fascinating conclusions as well as more questions that need to be answered in future studies. 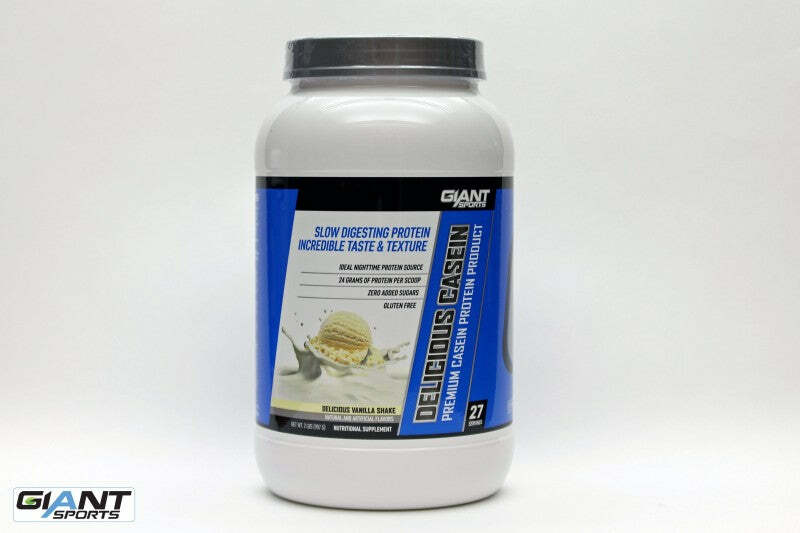 Giant Sports casein powder is the ideal nighttime protein source, featuring 24 grams of protein per scoop and no added sugars. Click here to order Delicious Chocolate or Vanilla Shake now. The study is admittedly small with a total of 17 male subjects. More info can be read in the Materials and Methods section in the link to the study. The other huge drawback is that this study utilized participants who had performed no aerobic or resistance training in the last 6 months. A far better approach in my opinion and likely more reflective as to whom is actually buying dairy proteins in 5 lb tubs, would have been to recruit real athletes who were actively involved in a rigorous and stable aerobic/resistance training regiment for a substantial time period. I might have drawn subjects from a collegiate wrestling program or track and field group instead of the group chosen in this study. Look, all studies have limitations and this study is no exception. Nonetheless, some of the results of this study were fascinating. Whey protein and casein have similar amounts of EAAs with whey having about 8% more, at about 50.09g of EAA per 100g and casein having about 46.53g of EAAs per 100g. However, whey protein contains substantially more leucine, an amino acid widely regarded as the single, most important amino acid amongst strength training athletes. Whey protein contains about 11.77g of leucine per 100g while casein contains about 8.77g of Leucine per 100g. This gives whey protein a 34% advantage in net leucine content over casein. The above information alone ? on its face ? would make most people heavily gravitate towards whey protein at the expense of casein. And in reality, this appears to happen with whey proteins vastly outselling caseins. But let's look at the results when healthy males ingest whey protein versus and casein in this study? Subjects in the study received either water (placebo) or either 0.30g of whey protein or casein per kg of LBM within 5 minutes post workout (this corresponds to ~20g of total protein ingested). In this study, we see a higher spike in plasma insulin and overall, total plasma insulin levels in the whey protein group from 15 minutes to 6 hours post-workout. The peak insulin levels were on average something like 60% higher in the whey protein group and the total insulin increase was, on average, about 20% higher in the whey protein group. Interestingly, plasma IGF-1 levels were essentially equal between the whey protein and casein groups. One would probably assume that this would have a significant impact on plasma amino acid pools as the whey protein group caused a much higher insulin response. One would be wrong with such assumptions! Surprisingly, despite the much higher peak and overall total insulin response, there was essentially ZERO net difference in the total levels of plasma amino acids between the whey protein group and the casein group. This includes all the EAAs and in particular, leucine, as subsets. Again, looking at the insulin response that whey protein induced and the inherent higher concentration of leucine in whey protein (as well as BCAAs overall) this is somewhat peculiar and counterintuitive. An interesting sidebar to this is that for the amino acid, arginine, the casein group had a much higher plasma level for much longer when compared to the whey protein group and at many time points tested with the plasma level of arginine something like ~50% more in the casein group (note ? casein naturally contains a higher amount of arginine than whey protein, close to 25% more by weight in fact). Without delving into the super-techie molecular chemistry, more data of interest is that you get an earlier ?anabolic response? with whey protein and a more prolonged and later ?anabolic response? with casein. This begs a question we will need answered in another study it appears ? Is it better to have an earlier anabolic response that drops off much faster back to baseline or is it better to have a more moderate and prolonged anabolic response? The whole ?one hour post anabolic window? train of thought has absolutely not been correlated by the data in this study and in fact, this study would seem to disprove this as an urban wives tail (or internet broscience?). This study would indicate that at the end of the 6 hour post-workout period, while there are some techie differences in biochemical markers between whey protein and casein, the net muscle protein synthesis (total) between the two is virtually indistinguishable. Despite the extra leucine found in whey protein! Despite the increased insulin response note in the whey protein test group! ?? [I]solate was found to be too rapidly digested and absorbed to sustain amino acid concentrations needed for protein synthesis? Regarding whey and whey hydrolysate, no differences in digestion and absorption have been observed.? So much for isolates and hydrolysates being the cleanest, best and ?holy grails? of protein supplements! For those people trying to keep a tighter leash on their macros and calories it may be easier to do so with casein supplementation than with whey. While this is just one study and a somewhat limited one at that, it does move the proverbial needles in our set of gauges. If you can obtain virtually the same increases in muscle protein synthesis using casein or whey protein post workout are there any tangible benefits to using one or the other? And why isn't the 35% more leucine that is found in whey protein versus casein more of a mitigating factor in whey protein?s favor? Why aren?t the substantially higher peak and total insulin levels observed with whey protein inducing better anabolic responses than casein? While the authors in this study conclude ? and it's more a hypothetical conclusion than anything else ? that perhaps a the better solution is to use a blend of whey protein and casein to get the proverbial ?early hit with the concomitant long lasting effect? there really isn't any data presented in this study to substantiate (or repudiate) such. So at the very least more research is needed to test such a hypothesis. I don't know why the extra leucine native to whey protein does induce better muscle protein synthesis overall than casein. I don't know why the higher spiked and overall total higher increase in plasma insulin caused by whey protein versus casein does not result in a better anabolic response in the whey protein group as its known that insulin is a highly anabolic hormone, or at least it's assumed to be quite anti-proteolytic. What I do know is that all else being equal, if I can obtain essentially the same net muscle building effects with casein which causes a much lower peak and total plasma insulin rise - likely to be far healthier in the long run - as compared to whey protein? That works for me. Obesity, Type II diabetes and metabolic syndrome are becoming ubiquitous around the world, not just in the West. Continually hammering your pancreatic beta cells to produce ever higher and higher amounts of insulin over long periods of time is not conducive to long-term health and has been conclusively shown to correlate highly with insulin resistance. Leading to?obesity, Type II diabetes and metabolic syndrome and by extension a cornucopia of co-morbid conditions. The less insulin we ask of pancreas to secrete? The less insulin resistant we become and the healthier we are likely to be. And the longer we may actually live! There might be an argument for a trade off if whey protein provided something tangible over casein with regards to accelerated muscle building. But in this limited human study at least, we?re not really seeing that. Thus the case for casein, at least in my opinion, is easily made here. I would also argue that for those people trying to keep a tighter leash on their macros and calorie content that it may be a bit easier to do so with casein supplementation than with whey protein. While there exists some conflicting data, this study by Abou-Samra, et al (link is here) demonstrated, with the 32 subjects in this study that received a net of 20g of whey protein or 20g of casein, that casein, is far away better than whey protein at reducing subsequent caloric intake 30 minutes after ingestion. A 2007 study by Luhovvy, et al (found here) on behalf of Nestle demonstrated that other stomach contents can change the effects of various protein types related to appetite. When whey protein was compared to casein, both decreased ?pizza eating? to about 90 minutes after protein ingestion but casein decreased ?pizza eating? much more at 150 minutes after protein ingestion. I am sure that I can eat a lot of pizza in an hour! ?Ingestion of whey protein for seven days, as opposed to casein, has been shown to significantly increase insulin concentration (whey protein: baseline 33.00±11.6, post 39.93±14.5 pmol/L; casein: baseline 37.17±12.4, post 40.90±23.9 pmol/L) and increase insulin resistance using the homeostatic model of insulin resistance (HOMA) (whey protein: baseline 1.12±0.42, post 1.37±0.52; casein: baseline 1.25±0.46, post 1.39±0.86).? Remember, this is only after seven days of using a protein supplement. That is not only significant it is fairly troubling as increasing insulin resistance is probably the primary cause of metabolic syndrome and type II ciabetes. Caveat ? remember this was conducted in overweight and obese women primarily (35 women and only 5 men) who may have already developed some predilection towards metabolic syndrome. Still what happens to insulin resistance in whey protein users thirty days out? A year? However, just to show you how people can manipulate study data to mislead the public at large, I can extrapolate information from this thesis that demonstrates that whey protein increases REE/BMR about 67% more than casein. That sounds impressive! Two-thirds more! Awesome! And it the absolute truth, too! Except when you look at the numbers quantitatively and see that whey protein bumped REE/BMR by 4.5% while casein caused an increase of 2.7% for a net difference of 1.8%, which was determined by the author not to be significant (and it's not). This is why you need to fully read an entire study when so cited and make sure you?re not being mislead by people with an agenda to clearly and only sell you something. Finally, if you?re an ?athlete? who is not convinced that casein actually has something tangible to offer you over whey protein and are convinced that ?whey is the only way? to maximally build muscle and increase performance then consider the following study by Wilborn, et al, in 2013 (link here), where female, collegiate basketball players (i.e., ?real athletes who train regularly?) were given 24g of whey protein or casein both before and after training session for eight weeks. All subjects in both groups engaged in a highly structured, anaerobic resistance training program four days per week during this study. Both groups obtained significant improvements in body composition, strength and anaerobic performance. However, there was no statistically significant effect between the whey protein and casein groups in any variable measured.